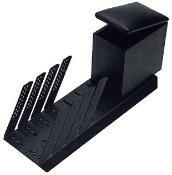 SHO-ME 07.1002 4 POSITION RACK WITH ARMREST. Holds up to four items such as radio, siren, PA system, switching systems, Mounting arms allow almost any style of equipment to fit rack. Padded armrest has storage space. Dimensions: 9 1/4"H x 8 3/4"W x 26 1/4"L. Made in USA.